Libraries can contain a very large number of Profiles, Fixups, Checks, Variables and Actions. A range of search options can help you find specific items. To search the complete corpus of Profiles, Fixups, Checks, Variables and Actions, use the Search Libraries menu item. This function can be opened via Menu > Tools > Search Libraries. You can also use the keyboard shortcut Shift-Command-F.
You can open the Search Libraries dialog via the menu button in the Profile window. 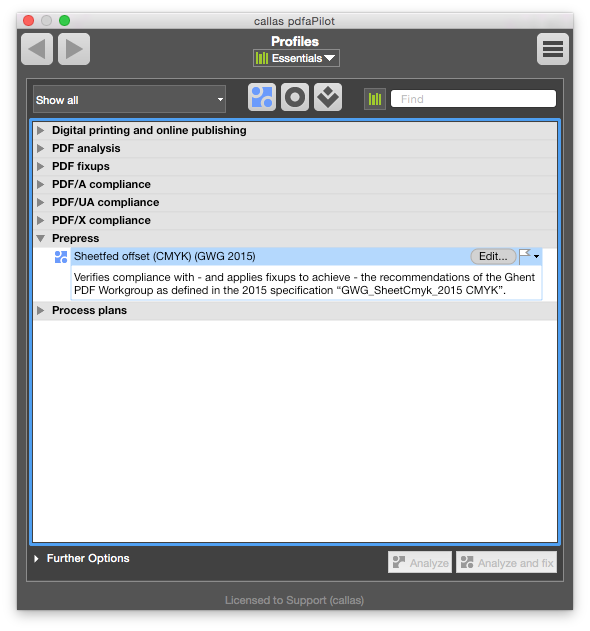 The screenshots are showing the sister product pdfaPilot. 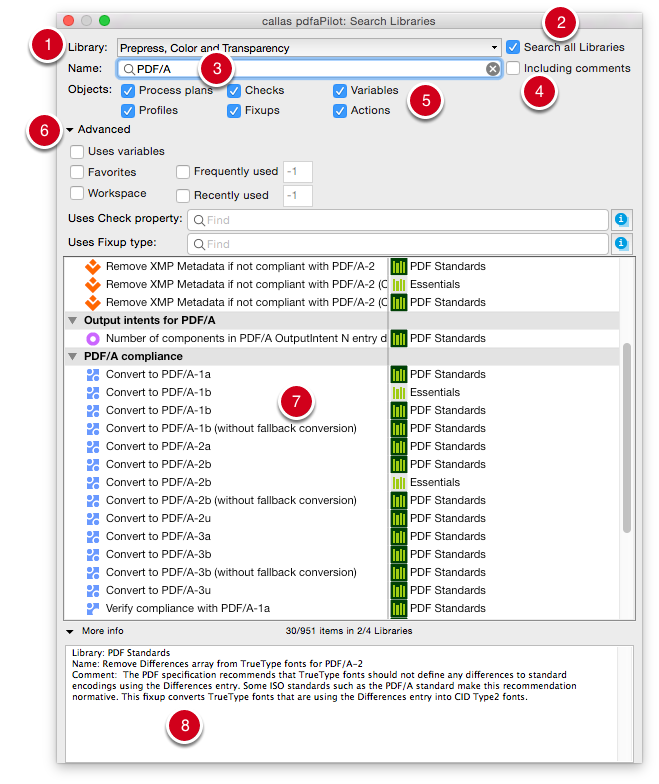 The functionality in this part of pdfToolbox is identical to pdfaPilot. 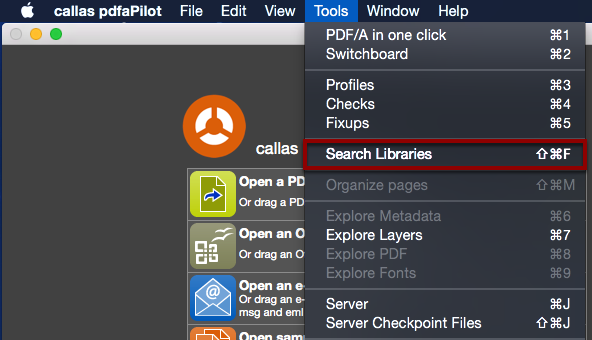 The Library to search can be selected via the drop-down menu. The Search all libraries checkbox allows you to search all libraries at once. Enter the search term under Name. The first results will be shown as soon as you start typing. You can also include comments used in individual profiles etc. in your search. The Objects category lets you restrict the search to Process plans, Checks, Variables, Profiles, Fixups and/or Actions. The Advanced category lets you specify even more detailed settings (Favorites, Variables, Workspace and Frequently or Recently used). You can also account for the use of Check properties or Fixup types. The results will be shown in the list along with their respective library. The More info box provides information such as the creation date/time and the author of the highlighted entry. You can also search within the windows for Profiles, Fixups or Checks. 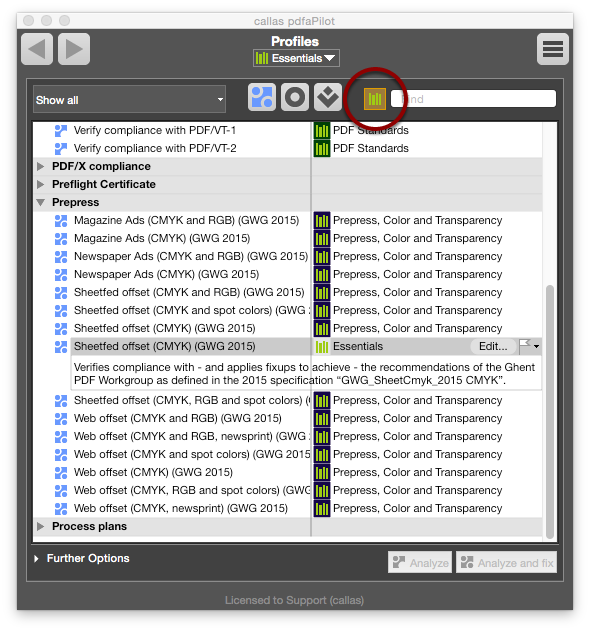 Only Profiles located in the currently selected Library will be shown. If you wish to search all libraries at once, first click on the library symbol next to the search box. Search terms entered into the “Search” box will then be searched for across all libraries.